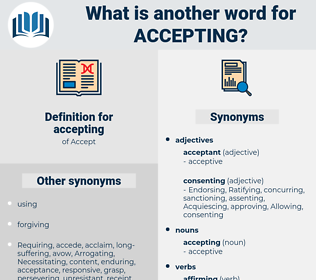 What is another word for accepting? Embraced, agreed, Took, Heeded, Underwent, received. Acknowledging, Appreciating, Adopting, Rejecting, Acceding, Incorporating, Acquiescing, Adapting, recognize, recognized, Recognizing, Tolerating, Admitting, Countenancing, practicing, recognising, appreciation, Endorsing, endorses, Refusing, Respecting, acquiring, Enacting, internalizing, Authorizing, assuming, catering, Subscribing, conceding, consenting, integrating, Considering, Mainstreaming, concurring, opting, Granting, confirming, supporting, authorising, contributing, reaffirming, Denying, collecting, Introducing, regarding, Legitimizing, Responding, Transposing, welcoming, Ratifying, Administering, legitimising, undertaking, Initiating, retaining, complying, Permitting, Placing, bearing, Beneficiaries, Allowing, engaging, performing, expelling, Charging, inviting, Adhering, withholding, gathering, paying, Utilizing, attending, Discharging, gratitude, Attracting, taking, toelating, passing, opening, Shouldering, acting, Addressing, handling, Employing, enabling, declining, Sheltering, greeting, Recruiting, upholding, proceeding, Chasing, Choosing, featuring, betting, coming, Delivering, Noting, play, playing, believing, satisfying, reaching, standing, absorbing, picking, Producing, saying, being, identifying, failing, exercising, processing, reference, matching, Embarking, Embodying, recording, register, Registering, convening, Including, clearing, Undergoing, Assisting, becoming, Hiring, starting, caring, Invoking, incurring, Having, qualifying, Licensing, deciding, Hosting, Resorting, Adding, calling, joining, dealing, fostering, covering, Fulfilling, offering, benefiting, investing, Referring, Resuming, harbouring, drawing, serving, selling, kissing, keeping, putting, closing, upcoming, seeing, home, bringing, thinking, Levying, know, launching, giving, buying, listing, looking, signing, holding, backing, focusing, going, getting, making, Doing, embracing. Accepting the fact of their romance, however, she could not but approve Paul's attitude. They make use of habit as the rest do, but they also continue to attend at critical points of action, and so make habit an ally in place of accepting it as a tyrant.